The District educates or interacts with nearly every full-time resident of Bonita Springs each year through 34 Public Education Programs. During 2017, the District participated in numerous community events, including children’s educational events, seasonal festivals, and parades. These events attracted thousands of people and provided the District with an unique opportunity for positive community outreach and fire and life safety education. The District believes what you learn today could save a life tomorrow. This is why it offers classes to prepare individuals to perform CPR on adults, children, and infants. While the classes are offered to residents and nonresidents, Bonita Springs residents pay half price. The American Heart Association curriculum covers treatment for choking victims and instruction on how to use an automated external defibrillator (AED). Under the instruction of the Lee County Safe Kids Coalition, the Bonita Springs Fire District became certified in 2008 to safely install child restraint seats. Through a donation funded budget, the Fire District also provides car seats to families in need. The District is proud to announce that it has 3 certified Car Seat Technicians through Safe Kids Worldwide. In 1996, the Smoke Alarms For Every (SAFE) Home initiative provided smoke alarms for the community. Throughout the year, free 10 year built-in lithium battery smoke alarms are distributed to families in need during community outreach events. The Bonita Springs Fire Control and Rescue District continued our Fire Safety and Injury Prevention Education Program for children and parents as part of the National Fire Safety Council. The Public Education Division is confident that fires and fire losses can be prevented, but children and their parents must be properly educated in fire safety. To support this program, businesses and community partners within Bonita Springs donate to provide fire safety education materials to children in Bonita Springs. This vital program assists the Fire District in teaching children fire safety and injury prevention. We strongly believe that by making children aware, we can prevent tragic fire losses and deaths. The Bonita Springs Fire Control and Rescue District has been associated with National Fire Safety Council, Inc. since 1988 and believe in their programs. In 2001, the District realized a need that wasn’t fully met on emergency scenes – emotional first aid. This program delivers additional support to victims beyond the emergency response, such as coordinating with the American Red Cross and other agencies for assistance with lodging, clothing, food, and emotional first aid. The Bonita Springs Fire District began offering the Community Emergency Response Team (CERT) class program in 2007. In 2017, there were 228 members on the team. Participants were instructed in disaster preparedness, fire safety, and extinguisher training, basic first aid, CPR, and automated external defibrillator (AED) training. The CERT Basic Training course consists of a total of 16 hours of instruction. The Department provided Public Information and communication. The District continues to enjoy an exceptional relationship with the media. The media served as a valuable vehicle for bolstering the community’s knowledge of the District’s events, safety presentations and classes, and by informing residents of hazards in their home, such as generator and carbon monoxide safety. 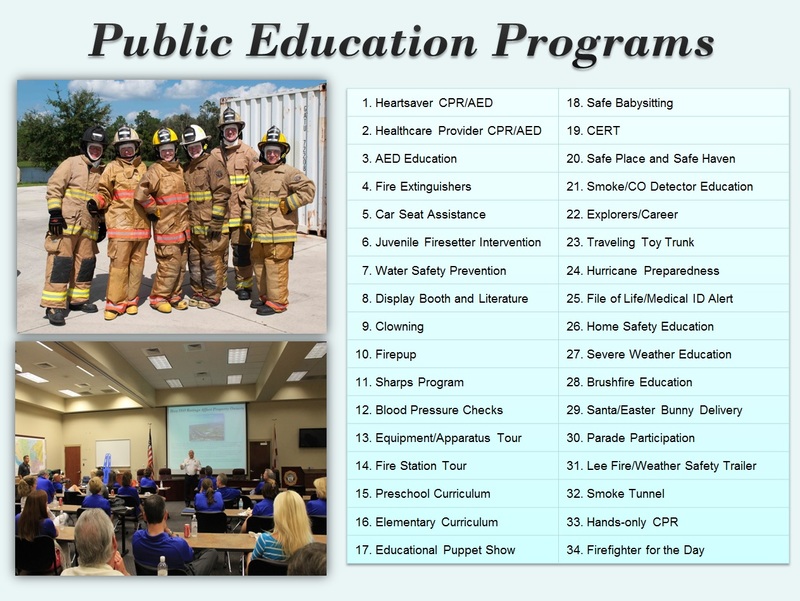 The District continued its educational programs for the community by offering fire and life safety presentation topics. A description of the topics can be found here.